I hope everyone had a great weekend. We enjoyed our weekend and did some cooking yesterday ( I taught Nikolai to wrap wontons in the morning), baked cookies in the afternoon and my hubby cooked a very nice Italian style dinner. 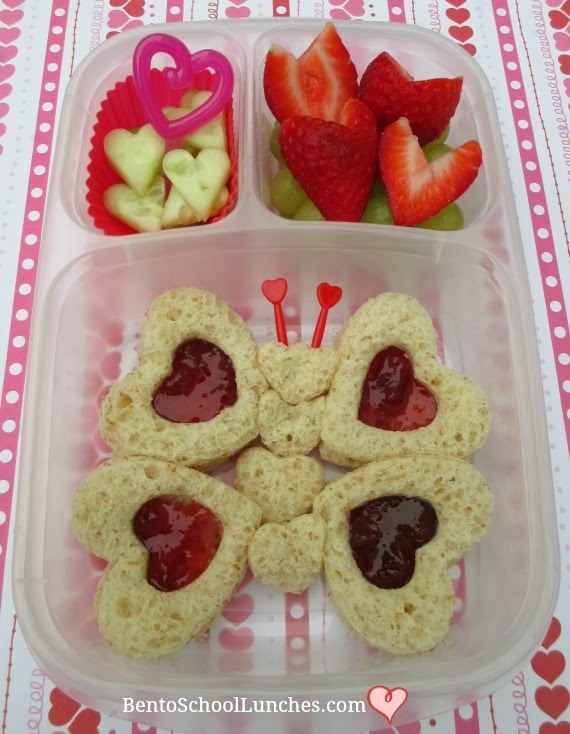 Butterfly shaped Linzer sandwiches with the removed inner heart shaped sections forming the center section with two small heart picks for the antennae. I used strawberry jam for the filling. Heart shaped cucumber slices in a silicone cup with a cupcake pick. Heart shaped strawberries above seedless green grapes. This is so creative n beautiful! Awesome idea for Valentine's. Oh I love the sandwich! It is so creative! So pretty!! I love how you use those heart sandwiches to form the wings and body! perfect for feb month! Such a pretty lunch, I LOVE the sandwich!